Not everything was better back in the “good old days.” Take dentures, for instance. Dentures have been around for generations and improved the lives of thousands of people who have lost many or all of their teeth. However, Grandpa’s traditional false teeth are not the prime tooth replacement. Traditional dentures can impede many vital oral functions: chewing, tasting, swallowing, talking, and smiling. You may know denture wearers who have stopped attending social activities because they are embarrassed by dentures that are far from inconspicuous. Some have even stopped eating their favorite foods because their dentures curtail their power to taste and/or chew. 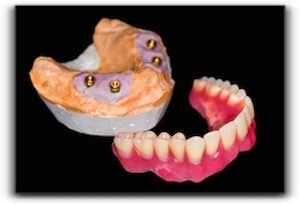 I have extraordinary news for San Jose residents with missing teeth: Dentures have evolved! Screw retentions require enough bone thickness to allow the implant to securely mesh with the existing bone. Unfortunately, some patients who have been missing teeth for a long period of time have experienced bone recession. For patients who lack the necessary amount of bone, mini-implants may be an alternative. Removable implant anchored dentures have a locator attachment which allows the wearer to snap the appliance in place. Some patients prefer this type because they can remove them at night for cleaning. Countless San Jose patients who have traded in their traditional dentures report that their implant anchored dentures have significantly improved their life. For more specifics about dental implants, call 408-266-9957 to schedule a consultation with Wes Yemoto. Wesley P. Yemoto DDS is located at 4860 Cherry Ave Ste F in San Jose. We have been providing quality care and personal attention since 1980.